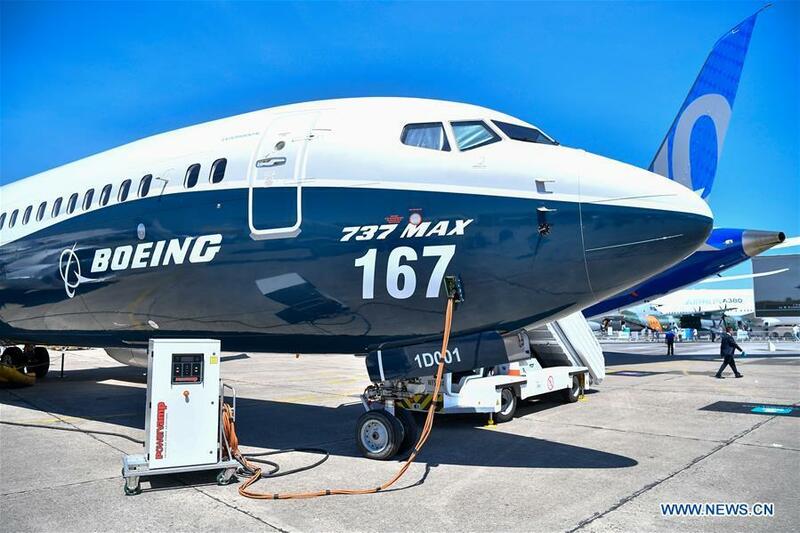 WASHINGTON, March 13 (Xinhua) -- The United States is grounding all Boeing 737 Max 8 and 9 aircraft, said U.S. President Donald Trump Wednesday, as it became the last major country to do so after two crashes by the model in recent months. "The safety of the American people, of all people is our paramount concern," Trump said. An Ethiopian Airlines plane en route from Addis Ababa to Nairobi, Kenya crashed Sunday, killing all 157 people aboard. A Lion Air crash in October in Indonesia killed all 189 people on board. Both were Boeing 737 Max 8 aircraft and circumstances surrounding both crashes shared alarming similarities. It is at this point unclear what the exact causes of the crashes were, though U.S. media reported that five complaints were filed against Boeing 737 Max aircraft by pilots on a federal database months before the Sunday crash, with one pilot calling the flight manual "inadequate and almost criminally insufficient." Furthermore, Boeing said it had been developing a flight control software enhancement for the 737 MAX in the aftermath of Lion Air flight crash. The Ethiopian Airlines crash took place before the enhancement was completed. The FAA announcement, made hours after Canada announced it is pulling Boeing 737 Max aircraft from the sky, reversed the FAA's previous statements defending Boeing. Southwest Airlines, a major operator of Boeing 737 Max aircraft in the United States, said it would immediately comply with FAA's latest requirements by removing its 34 Max 8 aircraft from service. Prior to the announcement to ground the aircraft, Southwest Airlines had been allowing free ticket exchanges to travelers who had booked flights conducted by Boeing 737 Max 8. The news would also come as a relief for customers of American Airlines, another major operator of the aircraft that had refused to offer free ticket exchanges for those due to fly one of the aircraft. U.S. Democratic Senator Richard Blumenthal, who has called for the grounding of the aircraft since Monday, said the FAA took a right but "overdue" step, referring to the fact that the United States was the last major country to halt operation of the questioned model, despite repeated calls from U.S. lawmakers, experts, and the public in the past couple of days for the FAA to prioritize safety. "This step is right, but unacceptably overdue. Our nation should be leading, not lagging, in air safety. Strong, immediate scrutiny is necessary," Blumenthal tweeted, stressing that the U.S. public deserve to know "when this possible defect was 1st known, what will be done about it & who is responsible." Pressure had been mounting for the FAA and Boeing to halt operation of the aircraft since its latest crash Sunday. Former FAA Safety Inspector David Soucie told U.S. media that he would "definitely" ground the Boeing 737 Max if he were in charge of the FAA. "I've never, ever done this. I've never said that, 'hey, it's unsafe to fly a particular model' but in this case, I'm going to have to go there... So yeah I would watch for that airplane," Soucie warned. Professional opinions prompted U.S. lawmakers across the aisle and industry organizations to join in unison calling for the grounding of the model, urging the FAA to join other aviation regulators in prioritizing safety. U.S. Republican Senator Ted Cruz on Tuesday pledged he would hold a Congressional hearing to investigate the crashes and called for the aircraft to be grounded before the all-clear is given. Many calling on the FAA to ground the aircraft point to a growing number of international aviation regulators, including those in China, Indonesia, the European Union and Australia, that have temporarily banned operation of the aircraft, as well as an expanding list of airlines also making the move.